Of course I'm thankful for my wonderful family, our heath and home, our jobs, and our friends. Since it is the season for gratitude, I thought it would be appropriate to show my appreciation for the things that make my running life better. Running buddy husband: I don't know what I would do without this guy. He might not be "jolly jogger" all the time, but he has supported me through all my training and helped me through being sidelined with injury. I probably still owe him big time for running the BAA Half Marathon with me (when neither one of us was prepared) just so I could get some bling! PT Brian: My Physical Therapist is the best because 1) he knows what he is doing 2) he listens to my complaints/symptoms 3) he married an Ohio girl - like me, oh wait, that shouldn't matter! 4) he's a master at Active Release Therapy and it works! 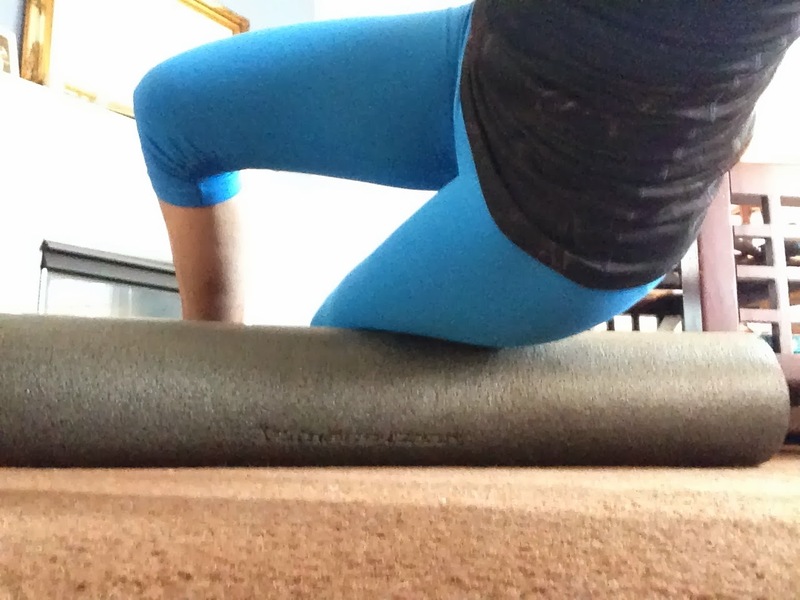 My foam roller: Since running that half marathon under-undertrained, I have been faithfully foam rolling every morning. Not only does it help loosen up my tight muscles and release tension, it is also great for a good back cracking and opening up the rib cage. Good running shoes: I'm grateful that I found Mizuno. The company boasts that you will find mezamashii, a brilliant run, in their shoes and they mean it. My Mizunos have helped me become a better runner because the shoes make running easy, and when it's easy, it's fun. By the way, have you seen the Mezamashii Run Project video I filmed in Atlanta yet? Under Armour Challenge: These monthly challenges saved me from going crazy during my non-running injured-runner days. Now that I'm addicted, the daily exercise helps me stay focused on keeping myself strong and shows me how easy it is to fit in a mini-workout every damn day. Plus they have great rewards! What's on your fitness gratitude list? Why not show yourself or a running buddy some appreciation and enter to win a fitness calendar? More details here! Giveaway ends at midnight November 17, 2013. A good coach is a great one! I'm thankful for my foam roller and my PT too! She is the voice of reason when I am a stubborn runner. Loved seeing you Mizuno video too! Hmm, good idea! I'm grateful for my amazing wife, who is my professional spectator, cheerleader, race photographer and masseuse! Foam roller is definitely high up there too!